Our step-by-step guide breaks it down for you. Tuna salad, egg salad, chicken salad, pasta salad, bean salad, steak salad, and a good ol’ green salad—you can make a salad out of almost anything. But the fact that the category is open to interpretation isn’t an invitation to throw everything in the refrigerator into a bowl. A good salad requires forethought and balance. 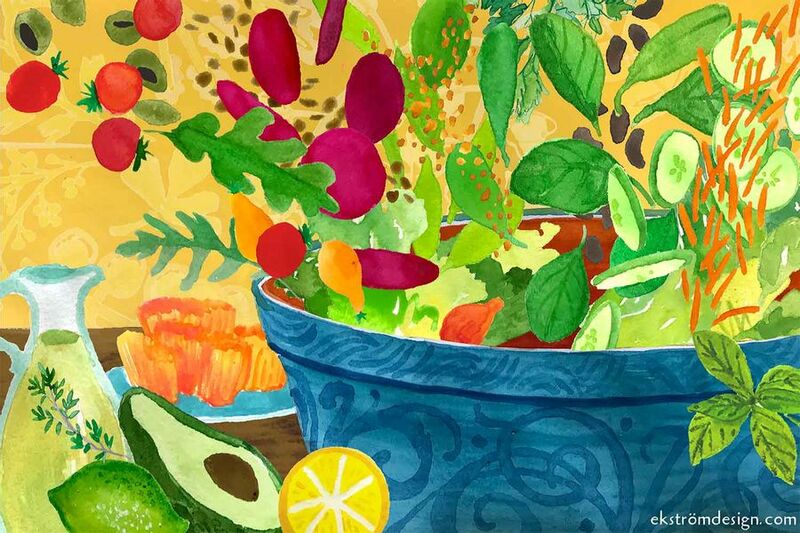 Sun Basket's Director of Nutrition, Lindsey Kane breaks it down to show you how to make salads that are delicious, satisfying, and nourishing. If there’s one rule that we live by in the kitchen, it’s that flavor trumps all. Before you get started, decide what you want your salad to taste like. Maybe there’s a specific cuisine that's calling you, such as Thai, Greek, or Mexican. Just like planning a vacation, you have to decide where you want to go before you can figure out how to get there. Here’s a chart to guide you to your preferred flavor destination. Start with a few overflowing handfuls of your favorite greens, be it kale, spinach, arugula, cabbage, romaine, or a mix. These fiber-rich foods provide a nourishing foundation for your salad. Choose vegetables that embrace the flavor profile you’re aiming for. For example, tomatoes, cucumber, and red onion for a Greek salad, or carrots, scallions, and snap peas for an Asian one. Since each color represents a different antioxidant, the more colorful your salad, the better. Raw and cooked vegetables are both fair game. If you have leftover grilled or roasted vegetables tucked away in the fridge, go ahead and tap into that stash. Now that you’ve optimized nutrient density with lots of non starchy vegetables, make sure your salad has energizing foods, too. Carbohydrates are your brain’s preferred fuel, so include some root vegetables (sweet potatoes, beets, carrots), whole grains (farro, spelt, kamut, millet, quinoa, brown rice), legumes (chickpeas, black beans, navy beans, edamame), and fruit. Keep refined carbohydrates (hello, croutons) and added sweeteners (looking at you, craisins) to a mindful minimum, as they are stripped of nutrients and offer little staying power. Because it’s a slowly digested macronutrient, protein offers long-lasting energy. Just three to four ounces of chicken, salmon, or canned tuna (BPA-free, of course) will do the trick. If you aren’t a meat or fish eater, no sweat. Many plants, like broccoli and spinach, have plenty of protein, and whole carbohydrates, like quinoa, beans, and lentils, offer a twofer, delivering both high-quality carbohydrates and protein. The other major salad blunder is leaving out fat. Good fats, like the kind found in avocados, almonds, and olive oil, slow digestion and boost satiety, but they also promote the absorption of fat-soluble vitamins A, D, E, and K. Fat is like the bus that transports fat-soluble vitamins to your cells. If you don’t have fat in your salad, these nutrients won't get picked up from your gut and delivered to the rest of your cells. Remember that there are good fats and less-nourishing ones. Plants rich in unsaturated fats, such as avocado, nuts, seeds, and olives, are a great choice for salads. Dressings can make or break a salad. A flavorful one can turn even the simplest of salads into a dance party in your mouth and boost the nutrient density of your meal. Skip store-bought dressings with their long lists of heavily processed and unrecognizable ingredients. Instead, revisit your flavor profile guide and whisk together oils, vinegars, spices, herbs, and aromatics that represent your cuisine of choice. Or, keep things simple, and order a Sun Basket Signature Dressing like Green Goddess Dressing, Vegan Caesar Dressing, or Sesame-Miso Dressing with your next Sun Basket order.